To get an idea for just how extensive our service is, see & hear real customers discussing their new kitchens now by selecting the [Customers] button. There are seven full customer interview videos with an average running time of 5 mins each. Information on our project management capabilities can be found in the [Projects] section. The interviewed customers also describe their thoughts on total project management. We can design, supply & build using kitchen furniture etc from several manufacturers ranges. The principal ones we use are: Masterclass, Four Seasons & Chippendale. Photographs of the hundreds of styles available can be viewed from the relevant links. But first, please get a feel by viewing our introductory video !!! anyone who is looking for a newly fitted kitchen. 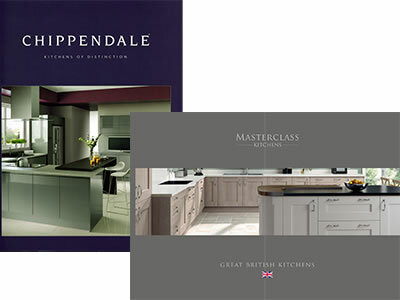 We provide full colour 3 dimensional designs, and as City & Guilds Qualified Electrical Installers and Gas Safe Registered gas engineers, we have over 20 years experience in the business of fitted kitchens, and we pride ourselves in fitting to showroom standards. Please call into our showroom to get a copy of our DVD. It contains all the videos on this website and can be viewed on your TV as well as on a computer. Customer Satisfaction Outstanding levels of customer satisfaction, we have an endless list of satisfied customers and receive much of our business through recommendations.